The binding energies are quoted relative to the vacuum level for rare gases and H2, N2, O2, F2, and Cl2 molecules; relative to the Fermi level for metals; and relative to the top of the valence band for semiconductors. 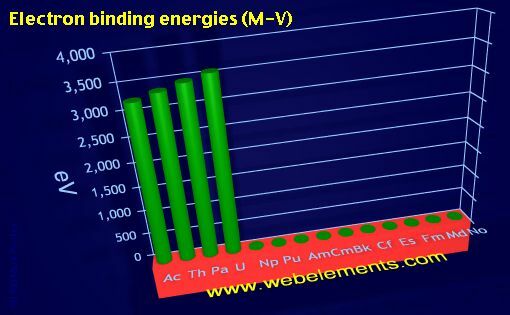 Image showing periodicity of electron binding energies (M-V) for the 7f chemical elements. I am grateful to Gwyn Williams (then Brookhaven National Laboratory, USA) who provided the electron binding energy data. The data are adapted from references 1-3. They are tabulated elsewhere on the WWW (reference 4) and in paper form (reference 5). J. A. Bearden and A. F. Burr, "Reevaluation of X-Ray Atomic Energy Levels," Rev. Mod. Phys., 1967, 39, 125. M. Cardona and L. Ley, Eds., Photoemission in Solids I: General Principles (Springer-Verlag, Berlin) with additional corrections, 1978. J. C. Fuggle and N. Mårtensson, "Core-Level Binding Energies in Metals," J. Electron Spectrosc. Relat. Phenom., 1980, 21, 275. D.R. Lide, (ed.) in Chemical Rubber Company handbook of chemistry and physics, CRC Press, Boca Raton, Florida, USA, 79th edition, 1998.